The Text Santa Event held at our offices on 18th December organised by Ben, Shaun and Jenny proved to be another successful fundraising event! A total of £141.01 was raised for 3 amazing charities – Macmillan, Make-A-Wish UK and Save the Children. And indeed there were plenty of sausage rolls, nibbles and mince pies to go around! It was great fun to see staff taking part and all for a good cause. 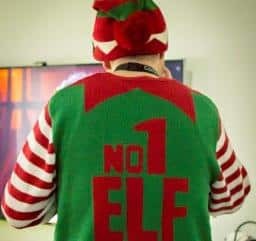 Staff were asked to wear something festive for the day and amongst the Christmas jumpers and t-shirts, we even saw Sam dressed in a Turkey onesie, Jenny as the Christmas Fairy and John as one of Santa’s Elves! Well done to Ben, Shaun and Jenny for organising another fun event and bringing the team together to make a difference once more.